The Arch Decora Window Boxes with Galvanized Metal Liners that are powder coated bronze are available in seven different sizes. These new Bronze Galvanized Metal liners are extremely rust resistant and provide more planting depth than most other garden center liners. Finished with a beautiful rolled top trim and holes for drainage these Galvanized Liners are a perfect complement to the Arch iron work design . Installing Arch Decora Window Boxes overflowing with your favorite flowers will add charm, elegance and a touch of your personal style to any home. Bolts sold separately and not included. 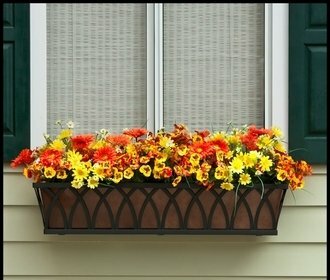 Your hardware will vary depending on the surface you are mounting your window box planter to.